Plans to regenerate part of Lillington by demolishing the area’s 1960s flats and moving residents to modern accommodation are now “dead”. This is the view of ward councillor Alan Boad (Lib Dem, Crown) in response to the announcement last week that land at Red House Farm between Buckley Road and Newbold Comyn, which had been earmarked for new houses, is no longer part of the Local Plan for housing and infrastructure in the Warwick district. Had this site been included in the plan, which has been modified by a government planning inspector before a final public consultation begins on April 17, it would have led to the Eden Court, Ashton Court and Southern Court blocks of flats in ‘The Crest area’ being demolished and replaced with new housing. “Very few discussions have been going on over the past 18 months and there had been no point in any public consultation while waiting for the local plan to be concluded. Grand plans to regenerate Lillington were first made public in March 2015 and included hundreds of properties being demolished and replaced with hundreds more and a ‘community hub’ at Crown Way. District council leader Cllr Andrew Mobbs, (Con, Kenilworth Park Hill) said: “The inspector’s modifications to the Local Plan deleted the allocation of land at Red House Farm. 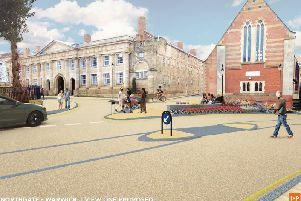 “This will impact on the options for regeneration that the council had been considering.